Join artists Leila Nadir and Cary Peppermint as they present a new project they are developing during their art-residencies at the Bemis Center: the OS Fermentation Salon. Put down your hand sanitizer, throw away your antimicrobial cleaners and join Leila Nadir and Cary Peppermint in creating edible artworks through collaborations with bacteria. While developing the OS Fermentation Salon Series, the Bemis Center artists-in-residence will lead participants on a pro-microbial healing journey through the art of wild fermented foods. Microbes help us absorb nutrients, regulate our weight, stimulate our immunity, stabilize emotions and even form a vital communication system between our bodies and the external world to make us more resilient to environmental changes. During Nadir and Peppermint’s three OS Fermentation salons and workshops, the public will learn about the global revival of fermentation as a practice of food independence and discuss the industrial food system and modern society’s war on bacteria. They will also sample the artists’ wild fermented edible art, including their acclaimed coffee-banana wine and blueberry-chocolate kombucha, create their own edible artworks made of fermented vegetables and partake in a tasting party to share their artistic concoctions. 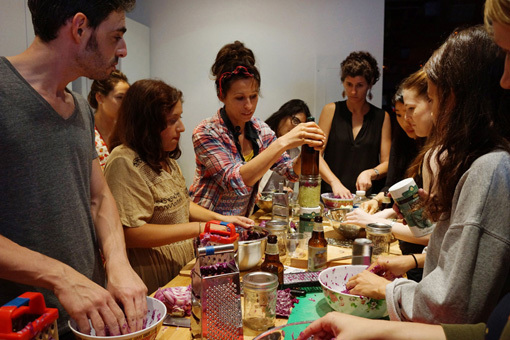 The OS Fermentation Salon Series, the artists’ new work-in-progress, is a slow-cooking class, healing ritual and spiritual revival of human-microbial proportions. It is also part of their Edible Ecologies project, a series of social sculptures that resuscitate historic food practices and facilitate recovery from what they call "industrial amnesia.” At a time when people are more confused about food than ever, and diseases caused by poor nutrition continue to rise, Edible Ecologies remixes ancient cultural practices to find creative ways for us to participate in our own healing and sustenance. Nadir and Peppermint believe that art can help people navigate the global health crisis, which they see as a crisis of creativity and imagination caused by the industrialization of food. *Registration for participation is now full. Email Laura Carlson, laura@bemiscenter, to be added to the wait list. The public is also welcome to come and observe the salons in progress. Meet the artists, imbibe their wild-fermented edible artworks and learn about the industrial food system and the global revival of fermentation with a reading from fermentation guru Sandor Ellix Katz’s famous cookbooks. The following reading is required for participation. Click HERE. Join the artists to create your own personal wild-fermented, vegetable-based edible artwork. Workshop materials will be provided at no cost by the Bemis Center, and participants will have the opportunity to learn about the artists’ fermentation techniques and experiment with different ingredients. Share the fermented food you’ve made during the workshops at our celebration tasting party and enjoy the final discussions about contemporary food production and how we can retake control of our own sustenance. Bemis Center Artists-in-Residence Leila Christine Nadir and Cary Peppermint study the imagination of food and the environment in the afterglow of modernization. Their projects take form as architectural interventions and urban wilderness tours, internet art and public performances, scholarly articles and poetic essays, and have been supported by the Andrew W. Mellon Foundation, K2 Family Foundation, Franklin Furnace Fund, Center for Land Use Interpretation, New York Foundation for the Arts, New York State Council on the Arts, and numerous academic fellowships. Merging the ancient and the modern, Nadir and Peppermint’s work navigates biological systems, primitive technologies, meditation practices, nineteenth-century romanticism, industrialization, and new media technologies. They have presented their projects at the Whitney Museum of American Art, Neuberger Museum of Art, New York University, Smackmellon Gallery, Exit Art, UCLA, MIT Media Lab, Banff New Media Institute, and European Media Art Festival. Leila earned her PhD in literature from Columbia University, and Cary earned his MFA from Syracuse University. They teach art, media theory, and environmental humanities courses at the University of Rochester in New York State.